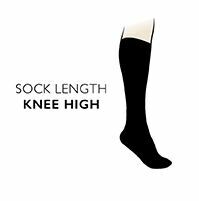 Anatomically shaped for perfect fit without constriction, pressure or tightness, Falke Sensitive London Knee High Socks follow the natural contours of your legs and feet, with a specific left and right progressive toe fit. The high cotton content makes them skin friendly and breathable, with just enough elastane for comfortable hold, with Comfort Cuff tops. The smooth, fine needle knit and handlinked toes for smooth seams make for a very comfortable wearing experience, with stress zones reinforced for added durability. Falke's confidence in the quality and comfort of the London style is backed up by plenty of happy SockShop customers, as the feedback testifies.